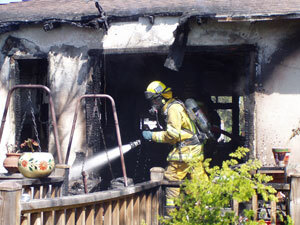 In 2002, about 75% of the structure fires responded to by the Escondido Fire Department occurred in homes. Most of these fires could have been prevented. Could your home be part of this year's statistics? To reduce the chances of a fire in your home, check through the following information carefully on a regular basis to keep your home clear of fire hazards. For additional information, see Eliminating Fire Hazards. A home fire escape plan should be drawn up with two ways out of each room. Make sure smoke detectors are properly installed and tested every month. Home fire drills should be held regularly. Exits should be kept clear of obstacles, especially combustible items. Keep a First Aid kit stocked and accessible. Make sure electricity, gas, and water shutoff locations and procedures are known. House numbers should be visible from the street. Water heater temperature should be set no higher than 125 degrees. Make sure electrical cords aren't running under rugs or carpets. Keep all electrical appliances, cords, and plugs maintained in good condition. Screen or glass panels should be kept in front of all fireplaces. Keep your chimney maintained clean and sound. Large, deep ashtrays should be kept available if smoking is allowed. Keep all combustibles at least three feet away from space heaters or heating vents. Candles should be secured in non-combustible holders, away from flammable items. Maintain your stove and hood to be clear of grease. No papers, trash, or dish towels should be placed near burners or ovens. Potholders can be kept handy but not close to the stove burners. Pot and pan handles should be turned toward the center of the stove. Outlets should not be overloaded. Nothing should be stored in the oven, on the oven handle, or on the stove top. Keep all electric appliances away from water. Flammable liquids such as aerosols, rubbing alcohol, and nail polish removers should be stored safely. Space heaters should be kept clear. Smoking should never be done in bed. Maintain all electrical items in good condition. Electric blankets should be turned off when not in use. Gasoline should always be stored in a safety can, and no more than one gallon should be stored at any time. Keep gasoline and other flammable liquids and aerosols stored away from your water heater or furnace. Water heaters and all spark-generating appliances should be kept 18 inches off the garage floor. Water heaters should be secured to a wall. Used cleaning rags should be stored in tightly-closed metal containers. Electrical equipment should be maintained in safe condition. Keep clothes dryers and vent hoses free of lint buildup. Sawdust and wood scraps should be swept up and thrown away. Keep your yard free of dry grass, weeds, and debris. Propane should be kept in a well-ventilated area. Keep a spark arrestor on your chimney.